The nest is quite beautiful. I can’t imagine how you you put it together. It was trickier than I expected, a slow build. Thanks Elena. The nest looks awesome! 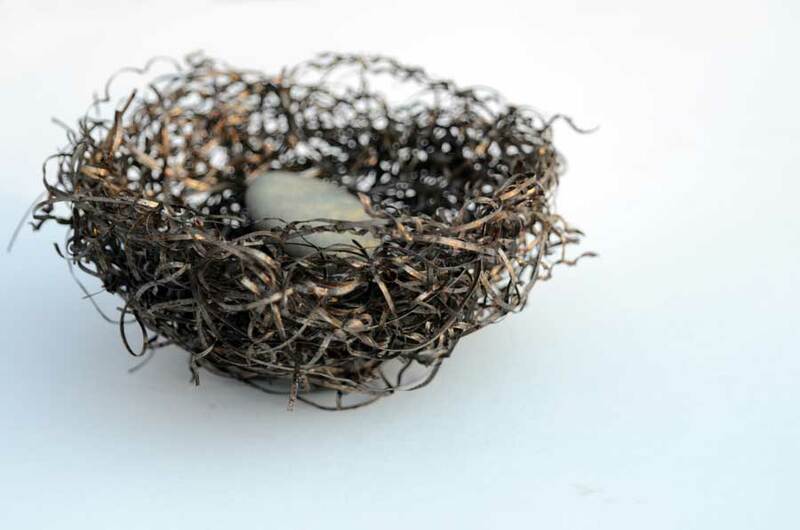 And I love the incredible amount of texture… I can’t believe you turned these metal shavings into a birds nest… looks like a bird did. Ha so cool! Very cool Karen, really like the execution. Could you weave to fit around/against shapes like the crook of a branch? It kind of also looks like its as much sculpture as weaving, do you think you could make other shapes with this (e.g., leaves..) Anyhow very neat! Thanks Al, I’ve got a plan to take this a step further, will post later! Karen, I think you did a wonderful job. 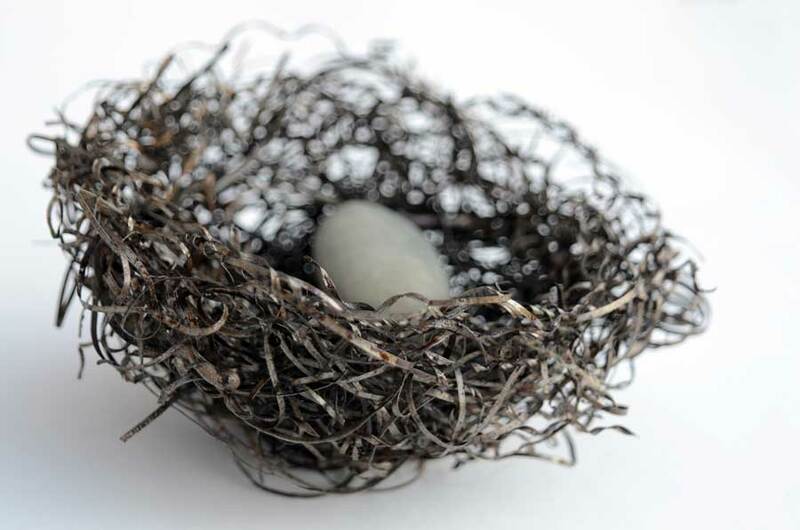 Perhaps this is indeed a very close interpretation to a bird’s nest – you don’t know as they all seem to be so different. 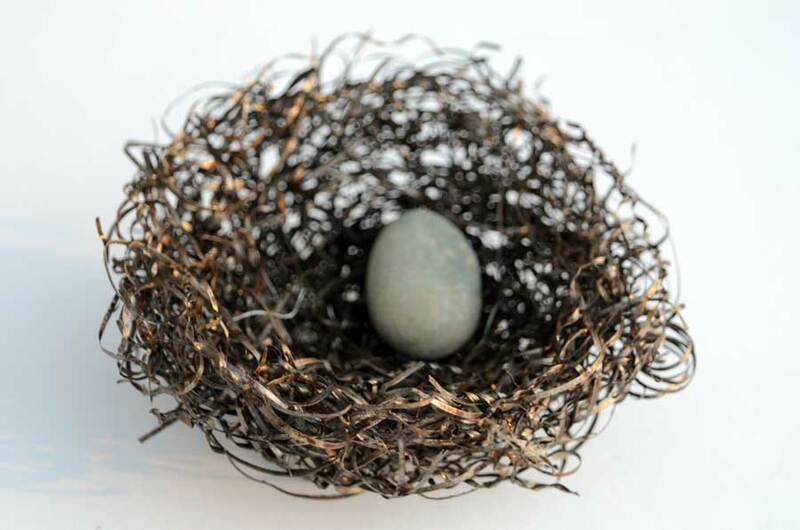 I love that you placed an egg shaped rock into the nest, and I also think your photography is stunning. I am so impressed! Thanks Marina, I’m working it into another sculpture. I just saw your post today – that’s an beautiful piece of art and I want it! do you sell your work at all? Thanks Karen – I’ll contact you soon! I love this. Amazing work here, and the photos are great too. Truly wonderful. These are very lovely Karen – execution and images!